Mike Sandlock is MLB’s eldest veteran at age 99. The Greenwich resident answered 7 Q’s this morning in a clear and gentle tone. Mike’s first MLB at bat came while pinch hitting in 1942 at Braves Field. 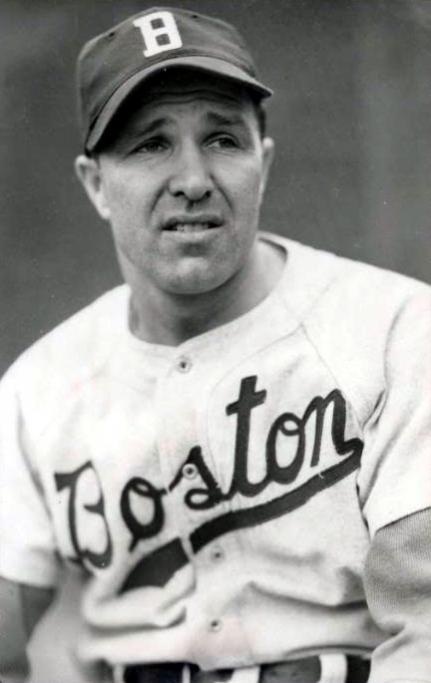 He singled off the Giants’ Fiddler McGee and scored on Clyde Kluttz’s triple. Mel Ott later homered to beat the Braves. Mike, You singled and scored in your first at bat. Were you nervous? I just felt lucky to have a major league uniform, you know? I pinch hit in that game. That was the year that I batted 1.000. Casey Stengel was your manager. Did you see him as a great manager at the time? A lot of the time he did not have a good club. When you don’t have the horses, nothing you can do. He was more comedian than manager. He enjoyed managing the Braves. He was alright to play for. You caught for Montreal in 1947 & 1948. Campanella and Newcombe were your team mates. How were the black players treated? Campy got big headed later in life with the $10 cigars, the 4 marriages, the big boat and big car and that surprised me because I didn’t see him that way when he was younger. Don Newcombe was a helluva pitcher. He just needed a little direction sometimes. I tried to help these guys as I tried to help all the younger players. If I could I would. When Jackie Robinson came up I was in spring training with the Dodgers in Florida, and we went to Cuba, too, and there was a rhubarb and the petition, too. But all that stuff never concerned me. I grew up with black guys and they were good guys and good ballplayers, too. I never had a problem. I also played golf with Jackie Robinson and he was a good golfer. He was a great athlete, the kind who could be good at anything. You were behind the plate for DiMaggio’s last professional AB. Did you speak with him? Oh sure, that picture of me and Joe is hanging on my wall. He hit a ground ball and I backed up first base. When he came to bat I said “Hi, Joe” and he said “Hi” back. Joe never talked much. Speaking of Italians, you should read the new book about 1957. In chapter 4 they give you every name they used to call Italians and Jews, Blacks and Polish, too. It’s a good book. My grandson picks these books up and sends them to me. We all share them. You’re Polish; who was the greatest Polish ballplayer of all time? (Beat.) Stan Musial, of course! He was a helluva great player and a good catholic polish lad. I never spoke with him. He was in St. Louis and I was in Pittsburgh. I would say he was the greatest. And I had dinner with Yaz. Yaz was a happy-go-lucky fella but he didn’t speak good Polish. The difference between Stan and Yaz was that Stan was nice to everybody. What memories do you have of Bulkeley Stadium and Hartford in 1940 ? Sure I remember playing in Hartford in 1940. I was not well-liked by the manager, never got much of a chance to play. They shipped me to Class B. Bulkeley was an old wooden stadium. I think it had a short right field and a medium left field. It was OK. Pretty good ballpark. As a catcher who do you rank the best ever, Berra? Bench? Dickey? BORN ON OCT. 17, 1915, Mike is just a chip shot away from his 100th Birthday.